Building Automation Systems (BAS) are centralized, interlinked, networks of hardware and software, which monitor and control the environment in commercial, industrial, and institutional facilities. While managing various building systems, the automation system ensures the operational performance of the facility as well as the comfort and safety of building occupants. Typically, such control systems are installed in new buildings or as part of a renovation where they replace an outdated control system. Building Automation and Control Systems (BACS), Building Control System (BCS), and/or Building Management System (BMS)—same as “Building Automation System” or the subject of this page. Controls—This term is appropriate in describing discrete devices that control particular pieces of equipment or processes. Direct Digital Control (DDC)—describes the communication method used in modern devices (hardware and software). 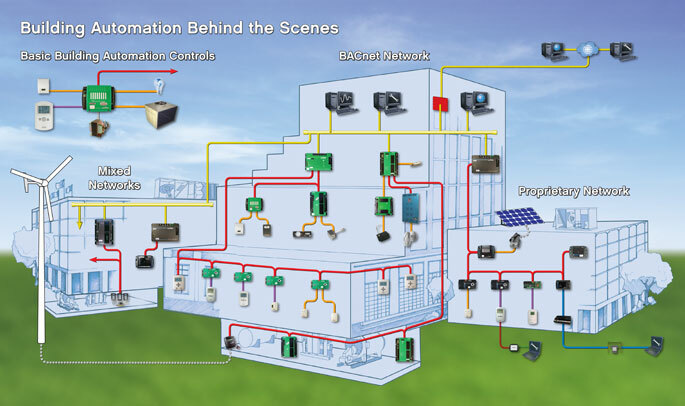 Collectively, DDC products control various building systems and form the automation system. Energy Management and Control System—well, you’re getting the idea. Smart (Intelligent) Building—a building equipped with a data-rich BAS. Lighting control is, likewise, low-hanging fruit for optimizing building performance. Early control systems were pneumatic or air-based and were generally restricted to controlling various aspects of the HVAC system. Common pneumatic devices include controllers, sensors, actuators, valves, positioners, and regulators. Due to their large base of installation throughout the 1960s and 1970s, pneumatic control systems are still in place in a majority of existing buildings, especially in established metropolitan areas. Analog electronic control devices became popular throughout the 1980s. They provided faster response and higher precision than pneumatics. However, it was not until digital control or DDC devices came on the scene in the 1990s that a true automation system was possible. However, as there were no established standards for this digital communication, various manufacturers, created their own (proprietary) communication methods. The automation system was fully functional but was not “interoperable” or capable of mixing products from various manufacturers. Thus, a given building or portfolio could be “locked” into a specific manufacturer. This is not necessarily a problem unless the relationship with the associated service provider is challenging. By the late 1990s and especially into the 2000s, movements were afoot to standardize on “open” communication systems. The American Society of Heating, Refrigerating and Air-conditioning Engineers (ASHRAE) developed the BACnet communication protocol that eventually became the industry open standard. What Does a BAS Look Like? Most of the automation system is behind the scenes as hardware devices mounted to equipment or hidden underfloor or in the ceiling. Some personalized control can be made available through thermostat-like devices. From a central management perspective, the BAS resides as software on an operator workstation (computer) or is available as a web page. Various types of “controllers” manage equipment and portions of the network. “Sensors” provide input data to the controllers. Who Installs or Services a BAS? A properly trained in-house staff can manage the operation and, sometimes, the maintenance of the BAS. However, system design and initial installation is almost always accomplished by controls professionals such as dedicated controls contractors or system integrators. In practice, the controls contractor is a sub-contractor to the mechanical contractor. Sometimes, the mechanical contractor will have a dedicated controls division. Electrical contractors with controls teams are also common and multi-functional system integrators are becoming more common for today’s complex facilities. These controls professionals can provide on-going service or train your in-house staff to self-perform service. The automation system can also offer you an incredible amount of data related to building performance, and with this data in hand, you can make more intelligent decisions. And, if you are building green, be aware that an automation system can contribute greatly to your ability to earn such recognition as the EPA ENERGY STAR or the LEED certification associated with the U.S. Green Building Council (USGBC). Wireless technology is beginning to replace traditionally wired BAS infrastructure. Thus far, however, the wireless technology is limited to sensor-type devices and suffers from issues including a lack of clear wireless standard, short battery life, and communication challenges through various types of building structures and materials. Enterprise-level initiatives are making the communication protocol of the BAS less important. While it is quite common to replace a pneumatic control system with a direct digital control (DDC) system, pneumatic-to-DDC bridging strategies also exist. More controls are coming to the construction site, factory pre-mounted to equipment. Hardware and software continues to be augmented by energy-related visuals. There has been tremendous consolidation among BAS manufacturers, leaving relatively few independent players (such as KMC Controls).